ManagedStatic - This transparently changes the behavior of global statics to be lazily constructed on demand (good for reducing startup times of dynamic libraries that link in LLVM components) and for making destruction be explicit through the llvm_shutdown() function call. Definition at line 79 of file ManagedStatic.h. Definition at line 82 of file ManagedStatic.h. Definition at line 92 of file ManagedStatic.h. Definition at line 90 of file ManagedStatic.h. 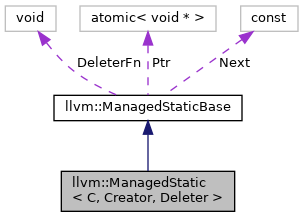 Definition at line 100 of file ManagedStatic.h.